After Japan’s victory in the Russo-Japanese War in 1905, “commercial Orientalism” continued to thrive as the American public still clung to the lingering traces of “Japan Fever,” even in the wake of a growing racialized threat in the form of a modernized Japanese state. The first decade of the twentieth century saw the heyday of Japanese themed stereoviews, as the three major publishing houses of C.H. Graves, H.C. White, and the Underwoods were offering no less than eight different 100-view sets. The growing popularity of amateur photography and the widespread reproduction of images more generally in books, magazines, and newspapers afforded less cultural prestige to the ownership of large collections of stereoviews. Eventually, “nickelodeons” and larger theaters would become the preferred form of “virtual travel” for most Americans by the 1910’s. By 1908, Underwood & Underwood issued its last major catalogue of stereoviews before downsizing its stock of negatives in a slow sell-off to its rival Keystone and transforming its business into one of the first stock photography companies. In addition to publishing the “Ponting set” of 1904, Underwood & Underwood continued to issue a second 100-view Japan set and a Russo-Japanese War set, both initially offered in 1905. Moreover, in looking to cater to sophisticated clientele, Underwood & Underwood began assigning a stereo-photographer to accompany wealthy tourists on world cruises aboard the S.S. Cleveland and marketed new sets directly to these cultured elite. Between 1908 and 1915, many of the new views were taken by anonymous company photographers, and possibly even accomplished amateurs, who joined the tourist excursion parties to various stops around Japan. I believe this stereocard to be from one of these later anonymous photographers. There are some clues in the scene which suggest it comes from the decade between 1905 and 1915. The wooden coin box in front of the offering table has lost its picketed fencing and small gabled roof, easily identifiable features found in photographs taken up through 1905. In addition, the presence of tourists atop the Daibutsu along with a small ladder at the lower right of the statue to facilitate the climb suggest this photograph was taken before these activities were forbidden, around 1914, if not earlier. Moreover, the composition of the image is quite unlike the images professionally published before. The mise-en-scène is uncharacteristically frenetic and claustrophobic. The foreground is cluttered with half-cropped onlookers dressed in western attire – likely members of a tourist excursion party? Their gaze is directed in several off-camera directions as they amble about the space with no seeming purpose. Significant visual attention is afforded to the two tourists standing in the lap and hands of the Daibutsu, confronting the viewer’s gaze directly. Their frontal posturing perched in front of the main tourist attraction reminds us of the endless number of albumen prints circulating the Yokohama photography studios decades before. For the tourists, this composition signals a desire to be seen, and as a consequence, to be certified in their quest for authentic exotica. Unlike the images of Strohmeyer and Ponting, which underscore the religious elements of the temple setting, this anonymous photograph substitutes the devoted worshipper with the discerning tourist. As a result, the Daibutsu is cast as a harmless object to be collected and admired for its aesthetic properties. It becomes a prop to secure the cultural capital of those posed in front of it. John Kuo Wei Tchen describes a market driven commodity Orientalism used to gratify the American desire for exotica that operated at the end of the nineteenth and beginning of the twentieth centuries. Although he is mainly concerned with explaining the desire for Chinese-styled goods, the same theory can be applied to the passionate American taste for Japan. See Tchen 1999. For more on the popularity of stereoviews during this period see Bennett 2006. 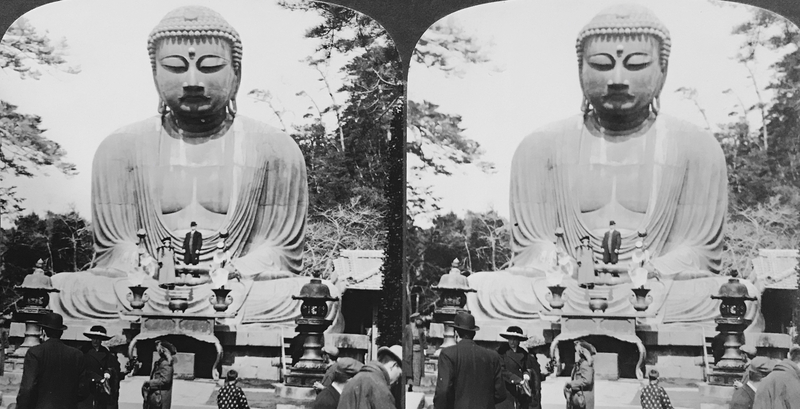 Specifically, the photos for H.C. White’s 1905 100-veiw set by Herbert Ponting were taken in the fall of 1904 and summer of 1905, and given the lushness of the foliage and warm-weather clothing of the onlookers strolling around the Daibutsu, it seems the image was taken in the summer of 1905. This is noted in the guidebook entitled Terry’s Japanese Empire, published in 1914 (pg. 29). By 1910, Ponting was alreadying noting the difficulty in taking photographs in part to the rude behavior of tourists looking to climb atop the Daibutsu, see In Lotus-Land Japan, p. 357. Given that Ponting last visited Japan in 1906, it appears this was a long-standing issue.